Your 14th wedding anniversary can be celebrated from the modern anniversary list with gold. - No longer do you have to wait for 50 years! Which is pretty awesome when you think it's about time for a bit of bling in your life. When most people think Golden anniversary they do think 50 and so most gift shops will have older couples in mind when they design their gold anniversary gifts, so we have been on the hunt for you and found the best 14th wedding anniversary gifts you can buy the love of your life. Traditionally the 14th anniversary symbol is ivory, meaning the rarity and highly prized value of marriage. Now don't panic we are not talking the real thing! That would cost a fortune!! There are instead some fantastic sculptures that are gold in color with lots of gold leaf. 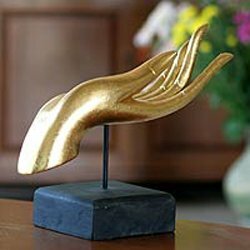 One of our favorites is this lovely gold Buddah hand sculpture welcoming you into your 14th year of marriage, which is available from Novica. There are lots of other stunning designs to choose from. A gold gift to treasure forever and one that is made even more special with a message from you. There are lots of gold jewelry to choose from and you can also add both your birthstones to a piece to make it even more personal. 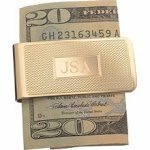 The man in your life may not want a cute bracelet but maybe a moneyclip with his initials, or a gold pen or gold cufflinks? These can all be personalized with your own message at Personal Creations and we have 25% off all personalized gifts for the man in your life! A gold picture frame for your favorite photo of the two of you or your favorite place would be a very special 14th anniversary gift and one that you can both share! This modern personalized anniversary frame is available at Personal Creations and makes a nice change to the typical anniversary gifts you see in gold. 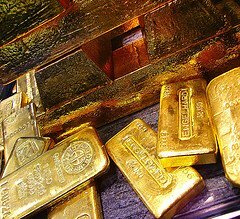 But as you can imagine it is not all about gold, there are other anniversary lists that have ideas for your 14th anniversary. On the gemstone list, your 14th anniversary is celebrated with opals. 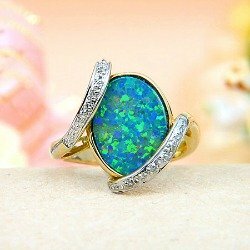 Opals are stunning and the meaning of giving a gift with opals is that it is the stone for faithful lovers. How romantic is that and perfect for 14 years together as husband and wife. As with gold, opals also bring an opportunity for travel. According to Wikipedia: Australia produces 97% of the worlds Opals, so that has to be the destination of choice! These are cool places to travel and what a great excuse ... not that you need one! Happy 14th wedding anniversary from all of us too! Just don't forget to send us a postcard.